The pride and glory of Rajasthan. Chittaur echoes with the tales of romance and valour unique to the Rajput tradition. 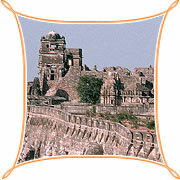 A ruined citadel, where the royal past lives in its imposing forts, graceful palaces and spectacular 'chhatris'. This fortified settlement has been ravaged thrice and each time the outcome was 'Jauhar' - when women and children immolated themselves on a huge funeral pyre while men donned in saffron robes of martyrdom rode out of the fort towards a certain death. Alauddin Khilji was the first to sack Chittaur in 1303 AD, overpowered by a passionate desire to possess the regal beauty, queen Padmini. Legend has that he saw her face in the reflection of a mirror and was struck by her mesmerising beauty. But the noble queen preferred death to dishonour and committed 'Jauhar'. In 1533 AD during the rule of Sikramjeet, came the second attack from Bahadur Shah, the Sultan of Gujarat. Once again, Jauhar was led by Rani Karnvati, a Bundi princess. Her infant son, Udai Singh was smuggled out of Chittaur to Bundi who survived to inherit the throne of the citadel. He learnt from his traumatic childhood that discretion is preferred to valour so, in 1567AD when the Mughal Emperor invaded Chittaur; Udai Singh fled to establish a new capital, Udaipur - a beautiful lake city, leaving behind Chittaur to be defended by two 16 year old heroes. Jaimal of Bednore and Patta of Kelwa. These young men displayed true Rajput chivalry and died after 'Jauhar' was peformed. Immediately thereafter, Akbar razed the Fort to a rubble. Vijay Stambh : The imposing 37 metres high structure with nine storeys, covered with exquisite sculptures of Hindu deities and depicting episodes from the two great epics -Ramayana and Mahabharata. It was built in 1440 AD by Maharana Kumbha, a powerful ruler of Mewar to commemorate his victory over the Muslim rulers of Malawi and Gujarat. The Fort: The indomitable pride of Chittaur, the fort is a massive structure with many gateways built by the literary rulers in 7th century AD. Perched on a height of 180 m high hill, it sprawls over 700 acres. The tablets and 'chhatris' within are impressive reminders of the Rajput heroism. The main gates are Padam Pol, Bhairon Pol, Hanuman Pol and Ram Pol. The fort has many magnificent monuments - all fine examples of the Rajput architecture. The ancient ruins of the fort are worth spending few moments in solitude. Sita Mata Sanctuary, Dhariyavad : This thickly wooded jungle sprawls over the Aravalli ranges and the Malawi plateau with three rivers flowing through the forest. According to legend, Sita, wife of Lord Rama stayed in this jungle in Rishi Valmiki's Ashram after she was exiled by Lord Rama. The common fauna that can be sighted here includes Leopard, Hyena, Jungle Fox, Porcupine, Sambhar, Wild Bear, four-horned Antelope, Nilgai and Flying Squirrel. There are Standard Hotels and also budget hotels available offering excellent accommodation facilities. Supplementary Accommodation: Circuit House, Railway Retiring Rooms, PWD Dak Bungalow, Irrigation Dak Bungalow. The beautiful wooden toys made in Bassi village near Chittaurgarh are the best buys. Besides these, there are 'Thewa' articles of Pratapgarh, printed fabric of Akola and leather 'Mojri' of Gangaur. Favourite shopping spots include Sadar Bazaar, Rana Sanga Market, New Cloth Market, Fort Road Market, Gandhi Chowk and Station Circle. Air : 90-km is the nearest airport, Dabok airport, Udaipur. Road : Bus services operate to several important destinations. Delhi (583-km), Mount Abu (297-km), Jaipur (325-km), Indore (325-km) and Ajmer (185-km) away from Chittaurgarh.